The IDF orders Palestinian residents from the northern Jordan Valley to evacuate their own homes in order to make way for military drills, which have previously damaged farmland and infrastructure. 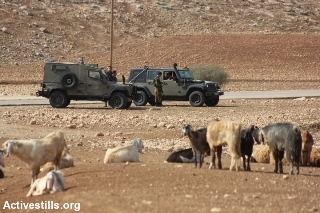 The Israeli army evacuated 10 families in the community of Khirbet Humsah in the northern Jordan Valley on Wednesday morning, according to the Israeli human rights NGO B’Tselem. The evacuation was ordered so that the military could conduct training exercises near to the families’ homes, on land owned by the residents of the community. B’Tselem further reports that the families were requested to leave at 6 a.m., and only allowed to return seven hours later. According to the families involved, upon their return they found some of their land burnt and discovered bullet holes in some of their water tanks. Unexploded ammunition was also found in the area, residents reported. Of the 10 families ordered to evacuate, B’Tselem reports that eight of them were displaced only a month ago, during extensive military training drills that lasted several days and displaced dozens of families. Those affected on Wednesday will once again be required to leave their homes at 6 a.m. on June 16 for the army to conduct further exercises. Wednesday also saw three other communities in the area served with evacuation orders in order to make way for military drills, B’Tselem’s report continues. The communities’ 180 residents – more than 100 of them children – will have to evacuate between 6:30 a.m. and 12:30 p.m. on June 11 and 17, respectively. The IDF’s repeated harassment of Palestinian residents of the Jordan Valley for the sake of training exercises is just one of the many challenges they face. The majority of the Jordan Valley (which makes up 30 percent of the occupied territories) is designated Area C, which is under full Israeli military and administrative control. Ninety-five percent of this area is under the control of Israeli settlements and regional councils, in addition to various areas which have been designated either “state lands,” closed military zones (including firing areas) or nature reserves. In addition, villages located within the Area C territory of the Jordan Valley are vulnerable to demolition orders, and several communities undergo repeated demolitions. The issue of planning permission for Palestinians in Area C made it to the Supreme Court last year. It was hoped that a petition to grant planning authority to Palestinian villages to build on their own land would pass, ending decades of discrimination in this matter. On Tuesday, however, the Court rejected the appeal [Hebrew], leaving Area C Palestinians with little to no say over development of their land. Given the Israeli government’s creeping annexation of the Jordan Valley, none of these issues are expected to receive any kind of a just resolution in the foreseeable future. The Israeli army’s training exercises, with all their attendant ruin, will also persist and are likely to intensify. In May 2014, Col. Einav Shalev of the Central Command – the section of the Israeli army responsible for units in the West Bank – confirmed to a Knesset committee that such live fire military drills in Area C are aimed at driving Palestinians out. Between government policy and military activity, the ethnic cleansing of the Jordan Valley is set to continue.